Last month, I did a bit of science policy standup. Part of the ‘Standup Tragedy’ series (one of the Guardian’s ‘ten great storytelling nights‘), the programme was a mix of spoken word, music, comedy and more. The podcast is now online – my piece starts at 45 mins in. I should warn that this was recorded after 11pm in a bar in Brixton. The language may offend. Within 2mins of my set I say “Isaac Newton was such a f*cking c*ck” and that pretty much sets the tone for the whole thing. I was inspired by this month’s topic of martyrs because it gave me a chance to talk about science’s persecution complex. Like much self-pitying posturing, I think science in martyr mode should probably check its privilege. I discussed the cases of David Nutt and the Galileo Movement, as well as the latest public polling data on attitudes to science and the ways in which politicians say they love some bits of science whilst speedily cutting others. I also discussed the Royal Society of Chemistry’s outrage over a mad scientist costume, suggesting that if chemists are worried that science is seen as violent, they might want to consider how many scientists are involved in industries of war. Rather than just screeching that people should pay more and more attention to science, sometimes science could do with looking at itself. As the public attitude polls show, bits of science regularly (and scientifically) audit their privilege. The data is there, it’s not hard. I also talked about how screwed up this idea that pain gives truth is, and that such macho posturing is not only a bit limited, but also plays a part in science’s diversity problem. Some truths are found in cuddles. Arguably having the freedom to have a life outside your job makes you a better scientist. If we stick to this weird idea that you have to suffer for science, we are only going to have a very limited view of the world. As a more honest manifesto for science in society, I ended with alternative version of the Galileo story; Bertolt Brecht’s powerful line “welcome to the gutter, brother of science.” I’d much rather sit with scientists in the gutter, looking up at the stars together, than see them pinned to a cross. This entry was posted in scientists on May 8, 2014 by alice. This is an edited version of a paper just published in Knowledges in Publics, edited by Lorraine and Simon Locke. This essay examines some ways in which images of children or the childlike are used in the construction of the scientist, and does so through the study of a series of books of the mid-20th century; Norman Hunter’s Professor Branestawm stories (1931-1983). 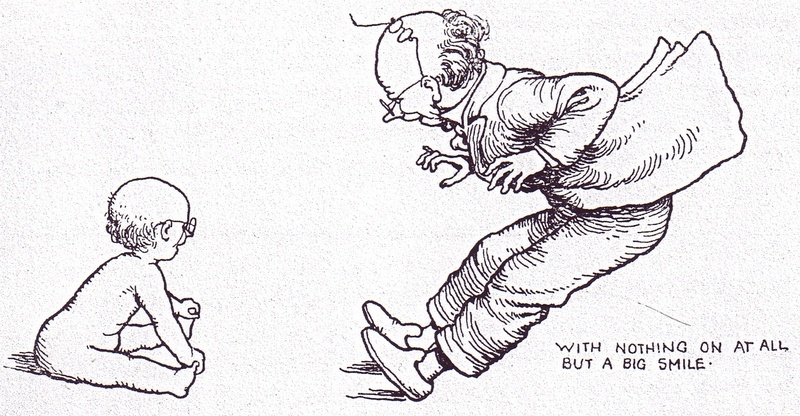 The character of Branstawm, I argue, was clearly constructed as childlike from the start – perhaps as an attempt to appeal to young readers – and yet as the decades move on the character shifts slightly to a presentation which, if not overtly “adult” looses the more childish aspects and is juxtaposed in opposition to children. The maturation of Branestawm is not offered to suggest science “came of age” in the latter half of the 20th century. Although this is tempting, it is also highly simplistic. Rather, it is an opportunity to explore some of the ways images of the childlike can act on cultural constructions of the scientist. I start with a brief discussion to images of children and science before introducing the case study. I then outline the ways I see Branestawm as a childish (and not-childish) character, before making some more analytical points about how this helps endow the scientist end of the character with some particularly powerful aspects of imagery surrounding the child. There are several ways in which aspects of the childlike may intersect with the various qualities generally associated with the scientist. It may appear controversial to call a scientist ‘childlike’: as if it was a criticism, or a form of dismissal. Yet such a link may also endow the image of the scientist with a rather special social status. A child-like science might be seen as trivial, silly and under-developed, but it can also be innocent and innately knowledgeable of nature. I have discussed this in more detail elsewhere (Bell, 2008a) but it is worth sketching a few upfront here. We might endow our ideas of the child and scientists in ways which make them appear very separate social identities. For example, we might imagine children as stupid, or at least naïve, in comparison to the wisdom of science. Such a figuring may then have an impact on the way we imagine the relationship between the two groups, seeing young people as necessarily recipients of scientific knowledge, in need of education to interact with science to be ‘full’ members of society or, for the select few, specific technical training in order to become, after time, scientists themselves. In contrast, however, we might equally see children as inherently good and connected to nature and juxtapose such imagery to depict science as corrupt and corrupting. This trope is arguably dominant in late 20th C children’s science fiction and fantasy, as discussed by Jacqueline Rose (1994), Noga Applebuam (2005, 2006), Perry Nodleman (1985). There are also ways in which imaginings of the child and scientists might be seen as similar; such as the idea that children are “little scientists” or, conversely, that scientists take a positively childish approach to interaction with nature, mixing scientific charactersitics of disinterestedness or curiosity with a sense of childish wonder and naivety (which will largely be the focus on this essay). pure, bestial, innocent, corrupt, charged with potential, tabula rasa, or even as we view our adult selves […] whether their forms of language, games and conventions are alternative to our own, imitations or crude precursors of our own now outgrown, or simply transitory impenetrable trivia which are amusing to witness and recollect; weather they are constrained and we have achieved freedom, or we have assumed constraint and they are truly free – all these considerations, and more, continue to exercise our theorising about the child in social life’ (Jenks, 2005: 2). We can see this in Rousseau and other Romantics, as well as in 19th and 20th century developments of developmental psychology, but we should not imagine such theorising of the child is merely a matter of work in ivory towers. It is important to note that when Jenks refers to ‘theorising’, he not only means academic work, but the quite prosaic theorising which we all do as part of everyday social life. We all theorise the child as part of social interaction. We draw on others’ ideas and/ or construct our own based on practical experience and personal moral/ political beliefs. Children, unlike other social groups such as those based around professions (i.e. the scientist) or issues of race, class, gender or sexuality has a rather odd status, because we were all one. The child is, in its own way, extremely familiar. Yet it is also quite strange; ‘he or she inhabits our world and yet seems to answer to another; he or she is essentially of ourselves and yet appears to display a systematically different order of being’ (Jenks, 2005: 2-3, See also Hunt, 1994, for introduction to politics of child/ adult relationships in children’s literature). Similarly, the scientists we are talking about here are very much the ‘imaginary’ ones of fictional depiction. As many sociologists of science have argued, what counts as ‘science’ is a confused, often contradictory notion which is strategically applied depending on context, rather than the consequence of an inherent ‘demarcation criterion’ (See Gieryn, 1995, for critique of this). In terms of the literary representations of the scientist, we might argue there are right and wrong ways to depict the scientist, and complain about incorrect and/ or overly negative portrayals (e.g. Lambourne, 1999). We could, however, acknowledge that there are a range of identities a scientist in culture might have, and a range of reasons why authors would wish to accentuate one or another of these. Taking this latter approach, tracking fictional scientists can become a way of working through the diversity of ways different people at different times have chosen to think about science in society. Rosalind Haynes (1994) seminal study of the scientist in Western literature suggests literary scientists can be sorted into six ‘stereotypes’. Although somewhat reductive, her typology is useful at least as a heuristic and reflects the ways in which scientist characters have in places become cultural tropes, repeated through culture as sketches and allusions. Haynes’ types range from alchemists driven to pursue an arcane intellectual goal that carries suggestions of ideological evil to more romantic depictions of an ‘unfeeling scientist’ where characters renege on human relationships only in the cause of science. Most important for this study is her sketch of the ‘Stupid Virtuoso’, a character out of touch with the society and so preoccupied with the trivialities of his private world of science, he ignores social responsibilities. This has similarities to romantic images of the unfeeling scientist, albeit slightly less heroically presented, and often comical. None of this is to argue that images of children and scientists remain purely as ‘make-believe’. The fictional, even the fantastical, not only reflects reality (Hunt & Lenz, 2001, Hume, 1984), but may have a constructive impact on the doing, making and selling of science. Although scientists may find fiction worrying, seeking to correct its mistakes (Kirby, 2003a) or put their own work at distance (Mellor, 2003) they may also find it a useful resource either in the construction of ideas (Kirby, 2003b) or rhetorical positioning (Mellor, 2003, 2007). As Megan Prelinger (2010) has shown in terms of discourses of the space race, allusions to science fiction also feature in advertisements for the recruitment of scientists, thereby playing a possible role in the construction at least some areas of science and engineering. Most interesting for this paper’s purposes, literary researcher Elizabeth Leane (2007) applies Haynes’ typology to those images of scientists constructed auto-biographically in non-fiction ‘popular science’ books by scientists, a loose application of Jurdant’s (1993) idea of popular science writing as the ‘autobiography’ of science. My argument, however, will be that all incarnations of Branestawm are, at once, both childlike and anti-childlike. If we wish to put this in a theoretical framework, I suggest Thomas Gieryn’s ‘cartographic metaphor’ for the boundaries of science (1995, 1999). This considers the cultural entity we call ‘science’ as analogous to a country on a map, its boarders defined through processes of boundary disputes and diplomatic treaties. The particular advantage of such ‘cultural cartography’ (compared to other frameworks for boundary analysis, see Lamont & Virag, 2002, for some examples) is that maps not only show us where two bounded groups are separated, they also declare shared space; demonstrating simultaneously similarity and distinction. It also reflects, although in a very different context, Ian Mitroff’s (1974) description of scientists’ dynamic alternation between ‘norms’ and ‘counter-norms’ of science, as well as what Simon Locke (2005) calls the ‘ambivalences’ of many cultural images of science. As we shall see, Branestawm, and I believe many more ‘real world’ scientists, negotiate the child/science boundary to take advantage of both positive qualities of childishness as well as the advantages of appearing distinctly ‘mature’. The first of Hunter’s Branestawm books, The Incredible Adventures of Professor Branestawm, was published in 1933. It comprised of a collection of stories based on those initially read on the BBC Home Service’s Children’s Hour. They were written by Norman Hunter, who had previously worked in advertising and as a stage magician, as well as serving in World War One in his late teens and is sometimes known as ‘Hunter, teller of tales’. Indeed, he is sometimes referred to as such in bibliographic databases, and the British Library copy of the 1933 edition has ‘teller of tales’ sketched in on pencil in the frontispiece (not by me). The book was illustrated by W. Heath Robinson, who by this time was already famous for his images of fantastic and humorous inventions. The Incredible Adventures were followed in 1937 with Professor Branestawm’s Treasure Hunt. After a break of several decades, during which the writer lived in South Africa, Hunter returned to writing for children, and published fourteen more Branestawm books from 1970 to 1983 (he died in 1995). Although all the Branestawm stories were written by Hunter, a new illustrator was brought in for the 1937 collection, and many different artists have worked with the character over the years. Heath Robinson is possibly the most well known, with his images re-used in several subsequent editions (1939, 1946, 1993) and arguably a strong influence on the later artists. Hunter’s stories centre on the character of ‘Professor Branestawm’, a scientist (or engineer, his specialism is ambiguous) who lives in a small English village. Typically the books contain a series of short stories, each of which describe Branestawm inventing something or trying to go about some form of social life, such as attending a party or returning a library book. Either he gets terribly confused himself or he will confuse other people (often both). In most cases, the invention goes wrong and causes some form of havoc and/ or even structural damage. The inventions are in many ways quite magical and are often anthropomorphized; in that respect the books are openly fantastical. It is worth remembering Hunter’s work as a conjurer here, and that the 1976 spin off activity book, Professor Branestawm’s Do-It-Yourself Handbook, includes several instructions for ‘science experiments’ which are largely magic tricks (although this is a long-standing trope in such books, see, for example, Secord, 2002). They might blow up a building or take over the house. In the 1970 collection, The Peculiar Triumph of Professor Branestawm we, unusually, find inventions which do work, although not in the way they were supposed to. However, interestingly, these were ‘invented’ by child readers, who won a competition run by the publisher to design a machine to be featured in one of the stories. The key feature of the Branestawm character, and basis for much of the humor of the books, is that he is a social outsider, someone the readers (and other characters) should take some amused bewilderment towards. He is, for many of his fans, the epitome of the absent-minded professor. As Branestawm himself reflects at one point: ‘How strange we professors are, to be sure’ (1933: 173). He finds it hard to communicate with people, and often has conversations at cross-purposes (1933: 130). He walks into a swimming pool because he is thinking too much about finding a library (1933: 88) and continually forgets where he is. When he discovers the library, he tries to buy a bun there, thinking it is a bakery (1933: 29). He finds social life difficult, cumbersome and confusing and often feels out of place and lost. The playfulness of this stereotype is very explicit: in one story, he ends up inadvertently doing an impersonation of himself at the seaside, where people think he is a comic pretending to be an absent minded professor (1933: 203). He has a housekeeper, Mrs Flittersnoop and a best friend, Colonel Deadshott, but generally chooses to be left alone to work with his ‘inventions’. The books have been translated into several languages, including Polish, Swedish, Italian, German and Thai[i]. There was a later BBC radio adaptation in 2001, and a television series in the late 1960s. One study of books used in British schools in the 1970s stated it was one of the top 20 books read allowed in primary schools, alongside the Chronicles of Narnia, The Borrowers, various works by Dahl and beating the Just William stories (Poole, 1986). They are still in print in the UK, although this is arguably largely due to the nostalgic tendencies of children’s publishing, and the books are less common today. Their attitude to race, gender and class would have kept them off school bookshelves from the 1980s onwards. In places, however, Branestawm appears to continue to resonate in British cultural imagery of the scientist; people will still refer to academics as having ‘Professor Branestawm hair’ as if it was an example everyone will know. Christopher Frayling suggests that the shorthand sketches children compose when asked to draw a picture of a scientist may come from computers, comics, cartoons, films or the cover of Professor Branestawm books (Frayling, 1005: 221) Arguably, it is strange that Frayling refers broadly to each media except for books where a very specific, rather out-dated example is given. However this only shows the power and apparent universality of the Branestawm image in particular cultures, which Frayling appears to belong[ii]. Variable Childishness of Professor Branstawm. I believe the original 1933 Branestawm to be quite overtly constructed as childlike, both in Hunter’s text and Robinson’s illustrations. Yet, Branestawm’s childishness is variable across the twentieth century. As with any long-standing character (Dr Who, Superman, Tom Swift) the cultural referents used to construct the character and stories changed over time depending on the context, although Branstawm retained the same author, albeit changes in illustrator and editors. One of the more overt examples of how shifts in the public views of science had an impact on these changes in the book is that the James Adams’ illustrations of 1937 edition are much more heavily influenced by images of Freud, as a hairier, bearded Branestawm is shown in a neatly drawn pinstriped suit. As I will argue, the character – more in text than illustration – seems to ‘mature’ somewhat when Hunter returns to writing about him in 1970, becoming less and less childlike throughout the decade, before reaching a sort of ‘2nd childhood’ in the 1980s incarnations. This section will provide a sketch of some of the more childlike aspects of the (generally early) Branestawm, sometimes in comparison with (later) more apparently ‘mature, forms of the character. To start with Branestawm’s childishness, for all his occasional seriousness in the face of social events such as parties, Branestawm has a clearly presented sense of fun. When the fair visits town, he is desperate to go (1933: 69 onwards). There are also childlike references to eating too much trifle and ginger beer (1933: 86); at bedtime he drinks cocoa and falls out of bed (1933: 169). His lack of social understanding also leads to quite childlike concerns, and he takes things to the extreme. For example, at the end of a fancy-dress party where the Professor and Colonel have gone as each other, people do not believe the had changed back from fancy-dress: ‘So they very nearly had to live in each others’ houses for the rest of their lives’ (1933: 154). 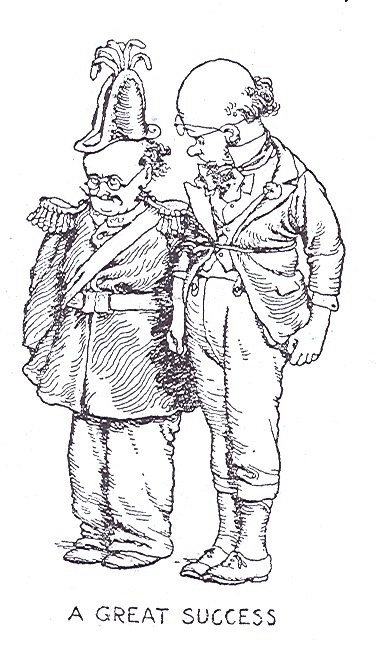 The early illustrations show both Branestawm and the Colonel as reasonably short compared to other characters, and they often crouch over slightly, without the more confident posture of an adult. 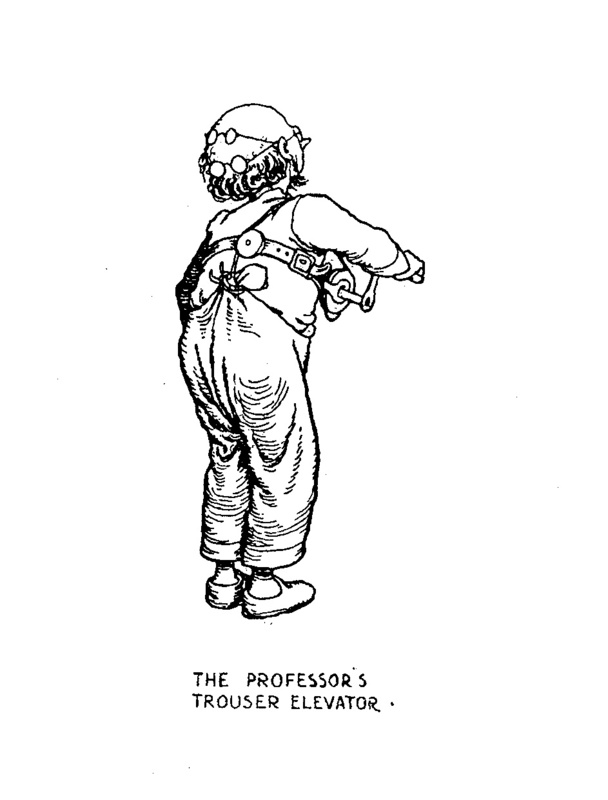 In one illustration Branestawm is shown wearing a ‘trouser elevator contraption’ (1933: 3), a set of braces attached to a fishing rod mechanism, which stops baggy clothes, falling down. This also has the effect of bunching the trousers around his bottom, making him look as if he is wearing a nappy. In the Heath Robinson images of Branestawm, he is often shown wearing clothes which are too big for him; as if he were playing at fancy dress, not quite grown into adult roles. The picture in the 1933 frontispiece shows Branestawm’s tie worn back to front, which is there as a symbol of the lack of care he gives to his clothes (a function of his absent minded-ness) but is also reminiscent of an untidy schoolboy. On some occasions the childlike is, perhaps oddly, constructed through references to symbols of old age. For example, he is depicted as balding. A baldhead is in many ways a symbol of old age, however, it is also has the effect of making the character look as if he hadn’t grown any hair yet. We are also told he has a large head explicitly because he is so brainy (1933: 7) but again, a large forehead is a rather baby-like characteristic. Interestingly, this is perhaps most overtly underlined when we see an image of Branstawm compared to himself as a baby. The Professor invents a potion that brings images to life, but his housekeeper accidentally pours it over a photo album, and facilities of Branstawm through the ages run amok throughout the house. One image shows Branestawm tacking aback by himself as a baby (1933: 121). The baby sits serenely on the floor on the left hand side of the page, grabbing his feet. The Professor mirrors this posture; while falling back in alarm, he bends his body in the middle in a direct reflection of the baby’s movement out to touch his toes. Although the professor is much taller than the baby, and clothed, the differences largely end there. They are both generally hairless. Significantly the baby’s hair is the course and frizzy type, characteristic of ageing, rather than light and soft curls. Further, the baby has glasses, despite overtly being much too young to wear them. This, to me, seems like a clear example of ‘ambivalence’ around child/ adult boundaries with respect to a scientist character, drawing similarity and difference at once. I also think it shows that Heath Robinson picked up on the same cues in the text as I spotted. The 1930s Branestawm is seemingly terrified of people. Characters from the rest of the village, when we see them, are shown to like him, but generally he hides from social life, with the exception of one friend, Colonel Deadshott. Such anti-social behaviour is also in some ways quite childlike, reflecting a child’s lack of socialization or shyness. The distinction being that an absent minded professor is innocent of society by choice or inclination; for a child it may be more temporal, but effects are similar. Branestawm’s lack of socialisation is also symbolised through references to his odd approach to clothes, language and food. Again, these could be seen as childlike, having not learnt. They are humourous because they are incongruous to what might be expected as normal, but there are also ways in which they figure the character as cute, almost useless in a childlike way (underlined by the housekeeper character, there to take care of him). They also make him slightly inhuman though, almost alien. On food, he would have breakfast overnight so he could start earlier the next morning on an important job (1933: 15). With clothes, as well as the fancy-fress and trouser contraption incidents mentioned earlier, he is referred to as making notes on his shirt cuffs (1933: 16) and at one point inadvertently puts on a ladies bonnet (illust., 1933: 48). Hunter obviously enjoyed linguistic play, and although notes like “He had very few friends because people found it so very difficult to talk to him” (1933: 1) are perhaps a nod to scientific jargon, the language used by the character is more a matter of being vague and imprecise, suggesting a lack of familiarity with language rather than having developed his own advanced form of it: (saying “thingummy” and “whateveritis” (1933: 3). Perhaps most significant, people are indulgent, or at least tolerant of his odd behaviour – Deadshott pretends to understand him (1933:4). In one incident he blows a man’s house up. The professor offers to build him a new one. “But the clock–man said he’d rather invent his own house, thank you all the same” (1933: 66). In the 1930s Branestawm hid away in his own private space of the home, and in the 1970s we see him out and about, interacting in more public spaces of libraries, school and parks. 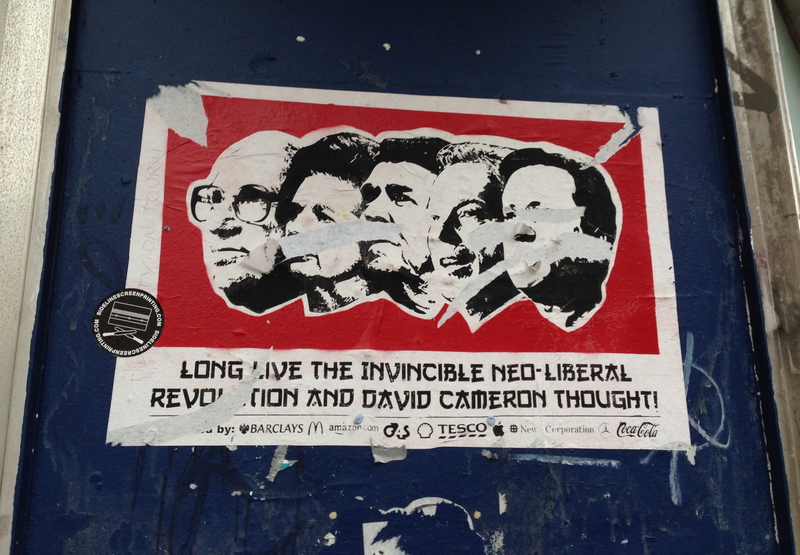 In the 1980s, we see a sort of synthesis of the two locations; the public world is brought into the home. It is thus a very domestic setting, but one at home and familiar with the outside world. In 1980s, he becomes much more explicitly affable and loveably foolish again, he has parties with jelly and ice-cream (1983b) and writes letters (1981b) although interacts with the world in a familiar way, not as terrified as he was in the early books, he generally stays at home (pleased when guests go home, producing a machine because he doesn’t like writing thank yous). He doesn’t want people around, although this rime around it doesn’t seem as if it’s because he is scared of others, more that he’s learnt they are annoying. 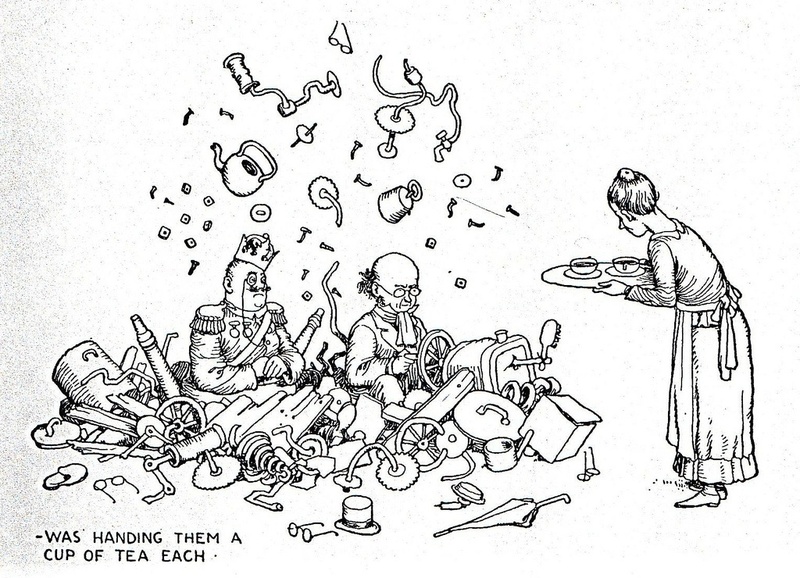 In the 1970 book, there are also several encounters with children, emphasising the distinction between the two social roles, and with less of the juxtaposition performed to also show similarity we saw in the 1933 Heath Robinson illustrations. As Branestawm moves into the 1970s, the central characters of these books are now ones for the children to laugh at and look at from afar, not play at being. They are funny because they are odd to the children, not odd like the children. Where as the 1930s inventions tend to be based in Branestawm’s home, designed to solve problems on running the house, in the 1970s, inventions are on a larger scale, working for public good of whole village, not just himself, based in the outdoors, in the centre of social life (parks, shopping streets, school). In the 1974 book, Professor Branestawm’s Great Revolution, the last story reveals what the revolution of the title is, the professor is asked to design a revolving restaurant. He also lectures at an institute for science and other scientist characters are brought in. There are references to the links between science and the military, as well as commercial culture. There is a greater sense of specialization. In first book it is not clear what he was a professor of; he invented machines, with the suggestion that he was an engineer, but he also had books on languages. Post war, he is more explicitly fashioned as a scientist/ technologist when he goes abroad it is not to anthropologically study the people, but to learn more of their inventions (1970: 37). Looking at the language, the Professor also discusses the science in slightly more detail, suggesting a rather more ‘adult’ vocabulary (compared with the thingummy and whatiscalled’s of the first book). There is even a rival Professor, Gasket Basket, who he gets into an inventing competition with, but uses underhand methods, employing “rascals” to steal Branestawm’s invention. Inventions in 1980s books return to rather more domestic settings (1981ab, 1982ab, 1983ab). This is very similar to what Rosalind Haynes (1994) calls the ‘stupid virtuoso’, and arguably pre-dates the more Victorian image of childhood present in the book. Certainly, an absent minded professor is not unique to these books. However, there are ways in which stupid virtuoso characters can be endowed with aspects of childishness, and worth reflecting on this to deconstruct them, and consider the ways they may influence our ideas about children’s relationships with science (and vice versa). From a study of Richard Feynman’s popular writing, she argues that behind anecdotes of asking for lemon and cream in your tea, or asking a servant to dance lies a notion of ‘the wise fool’. As Leane puts it, ‘the boy who saw the emperor’s nakedness’. These stories are applied to show how the scientist can debunk unnecessarily or cruel social practices and find the efficient, true and (morally) right way ahead (Leane, 2007: 151). She does not reflect on it being a boy (rather than a person of any age) which manages to see the ‘nakedness. Yet, this unconscious reference to youth is significant, as we see the idea of the innocent child intersecting with notions of the scientist as either ‘disinterested’ (Merton, 1973) or a ‘modest witness’ of nature (Shapin and Schaffer, 1985). Similarly, from 1981: “Suddenly he had an idea. Right out of nowhere it came. Like catching measles, only nicer” (1981b: 5). It’s maybe worth remembering Hunter as a stage conjurer who fancied himself the fancy-dress of the mad scientist; an odd reflection of JBS Haldane, perhaps, who in his Mr Leakey stories (1937) adopts the costume of a magic man, but equally uses a children’s book to play with ideas of the scientist as magician. As Haynes’ history of fictional scientists shows, this idea of scientist as magic man has a long history; if anything it is an especially old form of the character. However, it’s also worth noting that this an almost magical connection between the child and nature is a very common theme in children’s literature too. As Rose puts it, the child is “constantly set up as the site of a lost truth” (Rose, 1994: 43). Applebaum (2006) has argued that such nature-child connections are used to distance children from science, and critique the latter in many science fiction books written for young people. However, I think Branestawm is an example of the ways in which the two can be combined, endowing the scientist character with the various positive characteristics of the child mysteriously in nature (for other examples of this, see also Bell, 2008ab). This essay has considered some of the ways in which an image of the child might be woven into those of a scientist. I hope this helps us consider some of the detail of our cultural construction of scientists, in particular their rhetorical appeal. Oddly perhaps, the childlike can endow the image of the scientist with a rather unthreatening and intuitive association with natural knowledge, even if childlike scientists will also have to work to distance themselves from other images of youth such as the more pathological notions of ignorance, triviality or thoughtlessness. As Elizabeth Leane’s (2007) discussion of constructed public face of Richard Feynmen suggests, there is a rhetorical appeal to such constructions, as childlike imagery may provide powerful symbols of an apparent link to truth and/ or purity of purpose. Leane’s study also shows how these fictional representations make spill into non-fictional ones. Branestawm is not part of a concerted public relations campaign for science, but such images can be extended elsewhere to be. It would be a neat piece of analysis to argue that between the differences in age-based allusions of Branestawm are reflective of the emergence of ‘Big Science’ as a form of coming of age, but that would be too simple. To some extent this analysis is ahistorical anyway. Or rather, cross-historical. Not because what Branestawm depicts is in any way universal, but because children’s literature is so often carried across time. Due to the nostalgic tendencies of children’s book production and dissemination (i.e. that it is made by the generation before its audience, and parents often give books of their youth to their children), what Branestawm said about science then is largely what it says now. Branestawm is interesting today not only as an expression of science in the mid 20th century, but of one that both looked back nostalgically at the time and is still resonant in its nostalgia today; either through various recycling of post modern culture or more directly, as readers of the 1970s give it to their children, who give it to theirs. Instead, the variability and contingency of Branestawm’s symbolic childishness perhaps provides an extra analytical point. In the latter half of the twentieth century, Scientist characters became more central to public life, but at the same time would emphasise their special qualities to appear distinct. If I was to hazard any broad statement about the sweep of time the books reflect, it is that images of science became, perhaps, more ambivalent, drawing on the childlike images of the past and adding in new. The most recent edition of the 1933 book (which is the most long-lived) I could find was over a decade ago, but there are e-book versions, BBC last re-broadcast a reading of the stories in March 2011 and an online bookshop listing suggests a “Vintage” edition will be published again in 2013. So he may yet return, perhaps re-fashioned by a new author, illustrator or production team. Applebaum, Noga (2006) ‘The Myth of the Innocent Child: the Interplay Between Nature, Humanity and Technology in Contemporary Children’s Science Fiction’, The Journal of Children’s Literature Studies, vol3, issue 2, July 2006. Applebaum, Noga (2005) ‘Electronic Texts and Adolescent Agency: Computers and the Internet in Contemporary Children’s Fiction’, in Reynolds, Kimberly (ed) Modern Children’s Literature. (Basingstoke and New York: Palgrave). Bell, Alice (2008a) ‘The Childish Nature of Science: exploring the child/science relationship in popular non-fiction’ in Bell, Alice, Davies, Sarah & Mellor, Felicity (eds) Science and its Publics: Following Scientists into Popular Culture (Newcastle: Cambridge Scholars), 79-98. Bell, Alice (2008b) Science as Pantomime: Explorations in Contemporary Children’s Non-Fiction Books, PhD thesis, Imperial College London. Frayling, Christopher (2005) Mad, Bad and Dangerous to Know: The Scientist and the Cinema (Reaktion Books, London). Gieryn, Thomas F (1995) ‘Boundaries of Science’, in Jasanoff, Shelia et al (eds) (1995) Handbook of Science and Technology Studies (London: Sage) pp393-443. Gieryn, Thomas F (1999) Cultural Boundaries of Science. (Chicago: University of Chicago Press). Haldane, JBS. (1937) My Friend, Mr Leakey (Harmondsworth: Penguin). Haynes, Rosalind (1994) From Faust to Strangelove: representations of the scientist in western literature (Johns Hopkins University Press: Baltimore). Hume, Kathryn (1984) Fantasy and Mimesis: Responses to Reality in Western Literature (New York and London: Methuen). Hunt, Peter and Lenz, Millicent (2001) Alternative Worlds in Fantasy Fiction (London: Continuum). Jenks, Chris (2005) Childhood, 2nd edition. (Oxford: Routledge). Jurdant, Baudouin (1993) The Popularization of science as the autobiography of science, Public Understanding of Science, vol2. October 1993, pp365-73. Kirby, David (2003b) ‘Scientists on the set: science consultants and the communication of science in visual fiction’, Public Understanding of Science, vol 12(3): 261-278. Lambourne, Robert (1999) ‘Science Fiction and the Communication of Science’, in Scanlon et al (eds) Communicating Science: Contexts and Channels (London: Routledge), 146-157. Lamont, Michele & Virag Molnar (2002) ‘The Study of Boundaries in the Social Sciences’, Annual Review of Sociology 28:167-95. Locke, Simon (2005) ‘Fantastically Reasonable: Ambivalence in the Representation of Science and Technology in Super-hero Comics’, Public Understanding of Science, vol 14 (1): 25-46. Mellor, Felicity (2007) ‘Colliding Worlds: Asteroid Research and the Legitimatization of War in Space’, Social Studies of Science, vol. 37(4): 499-531. Mellor, Felicity (2003) ‘Between Fact and Fiction: demarcating science from non-science in popular physics books’, Social Studies of Science, vol. 33, no4: 509-538. Merton, Robert (1973) The Sociology of Science: Theoretical and Empirical Investigations, edited with an introduction by Norman W Storer (Chicago: University of Chicago Press). Mitroff, Ian I. (1974). Norms and counter-norms in a select group of Apollo Moon scientists: A case study in the ambivalence of scientists. American Sociological Review, 39, 579-595. Nodleman, Perry (1985) ‘Out There In Children’s Science Fiction: Forward into the Past’, Science Fiction Studies, vol 12: 285-295. Poole, Roger (1986) ‘The Books Teachers Use’, Children’s Literature in Education, vol 17(3) 159-180. Prelinger, Megan (2010) Another Science Fiction: Advertising the Space Race 1957-1962 (New York: Blast Books). Rose, Jacqueline (1994) The Case of Peter Pan, 2nd edition. (Basingstoke: Macmillan). Secord, James A (2002) ‘Portraits of Science: Quick and Magical Shaper of Science’, Science, 6th September 2002, vol. 297 (5587): 1648-1649. Acknowledgements: This work was carried out as part of doctoral research (AHRC grant no: 05/116470) at the Science Communication Group, Imperial College. Drafts of this paper were presented at several conferences. My thanks to the organisers of these events, as well as all attendees for their attention, suggestions and questions. [i] My thanks to the ‘academic discussion of children’s literature – uk’ listserv for assistance in tracking down Branestawm in translation. [ii] It should be noted that here Frayling is discussing a set of drawings produced by 7-11 year olds in the South West of England in summer 2003. An argument for the resonance of Branestawm in the subjects of the 1983 UK study he is replicating might be more convincing. This entry was posted in children, scientists and tagged childlike scientists, children, children's literature, literature, scientists on November 14, 2013 by alice. 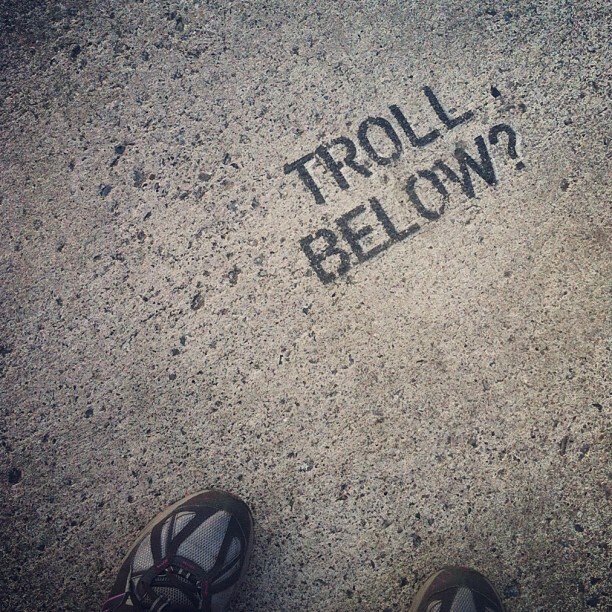 Troll Below? Science policy below the line. I have an essay in James Wilsdon and Rob Doubleday’s collection: “Future directions for scientific advice in Whitehall” (downloadable for free). It’s an invitation for the various greats and goods of science policy to not only use social media to promote their ideas but to “go below the line” and listen to the public there too. I know such listening is problematic – I’m not about to try to rehearse all the problems here, they exist and are generally very specific to the people and cases involved – but that doesn’t mean you can’t try. We should ask what we want openness to mean online, what forms we want to invest in, and how this should be organised. There is a lot more to open science than simply open access. Indeed, a preoccupation with the latter as a solution to social ills may well be a way of avoiding dealing with the former. Further, how we choose to finance and manage forms of open access is far from straightforward. Whilst politicians, scientists, publishers and learned societies argue it out, the #icanhazpdf hashtag is gradually whittling away at current publishing models (used so people looking for paywalled papers can find those with institutional log-ins who are willing to be generous on their library’s behalf). Scientists may feel persecuted by activists, especially if they engage in debates over climate change, alternative medicine or animal rights. They may also feel that when work flows into ‘social media’, even more of their private lives are being taken over by work. Online interaction can be tiring. A related issue is whether the public can be trusted with science in the open. One might, for example, feel pleased when the Science Media Centre manages to keep a story out of the press (as when I heard senior scientists cheer in the case of a story about GMO food last year). Alternatively, one could follow the lead of the Cancer Research UK news blog which accepts that stories they don’t agree with will get published, but uses the more open spaces of the web to put extra context out there, hoping those who care will find it. One recent piece of research argues that the ‘incivil’ tone of web comments can derail evidence-based public debate on science, technology and especially environmental and health issues. For all that I can personally relate to this (having uncomfortably found myself being incivil myself, as well as at the receiving end of incivility), such calls for polite behavior online leave me uneasy. Complaints about ‘tone’ are too easily used to quell dissent. Words like ‘troll’ can become a proxy for what is, at best, disagreement, and worst, class hatred. It is now 18 years since Bruce Lewenstein suggested a ‘web model’ as an alternative to top-down ideas of science communication in his study of the cold fusion controversy. This networked view seems almost too obvious today, as gross a simplification as the deficit model. But it contains an important message that is increasingly hard to ignore: the simple messiness of scientific discourse. Although neater debate has its uses, especially in policymaking, that doesn’t mean we should aim to tidy it all up. This mess is how we build capacity for more coherent exchanges, build trust, learn and digest. It is also where people can show dissent and support for science, both of which are important. We should be wary of being too spooked by the incivility or apparent lack of expertise online. As science policy debate bleeds onto social media, we shouldn’t be scared to take a dip below the line, and take some time to look and listen. You never know what we might find. 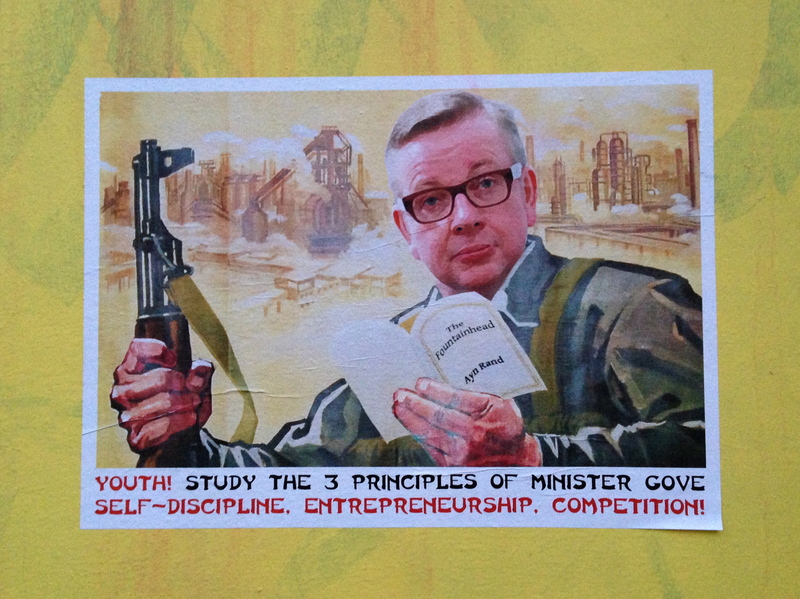 For personal reasons – and partly to make a slightly tongue in cheek point – comments are closed for this entry. This entry was posted in blogging, scientists, web and tagged blogging, publiciation, science policy, scientists, web on April 19, 2013 by alice. Rafols, Ismael, Hopkins, Michael M, Hoekman, Jarno, Siepel, Josh, O’Hare, Alice, Perianes-Rodríguez, Antonio and Nightingale, Paul (2012) Big pharma, little science? A bibliometric perspective on big pharma’s R&D decline. Technological Forecasting and Social Change. You might be forgiven for thinking the pharmaceutical industry doesn’t publish research. It does. Quite a bit. “Big Pharma” (the world’s 15 largest firms) have around 10,000 publications. It’s still only about 4% of total publications in the field (and to put that 4% in some context, Big Pharma firms invested £46 billion per year in research and development between 2004-07, compared to the National Institute of Health’s £15.25b). But looking at some of the whats, whens and wheres of Big Pharma publishing can be interesting. They seem to be publishing around 9% less than they did 15 years ago, in slightly different areas, with evidence of different collaborations in ways which suggest they are a bit more of a follower than a leader when it comes to science. Although the issue is very complex, as the paper notes in its conclusion, is Big Pharma is not doing the research itself, will they be able to continue to be able to justify their large profits? The researchers used Web of Science to download publications – “article” “letter” “note” “proceeding paper” and ”review” – from the largest 15 European and American pharmaceutical firms, amounting to a total of 160,841 records for the 1995-2009 period. Note: Here “European” meant they had an affiliation to at least one European Free Trade Association country (EU + Switzerland, Norway, Lichtenstein and Iceland). Though I’m personally taken by the idea of applying a Eurovision view of “European” in research policy data collection, I guess the politics of Israeli publishing might be a complicating factor. Also it’d just lead to really bad null points jokes in seminars. The data was then analysed with VantagePoint software, and they used Pajek and VOSviewer to create visualisations. There are different motivations to publish in the drug discovery and drug development stages. In the discovery phase, publications can signal to investors but participating in the more traditional exchanges of “open science” (open in that they are published, even if there’s a paywall) also allows industrially based scientists access to the resources of the scientific community. In drug development, a degree of openness is often required due to the need for clinical evidence for the uptake of innovations. The authors argue that the evidence-based medicine paradigm has encouraged this (though some might argue not enough). They also suggest that scientific publications are sometimes written to diffuse information about the effectiveness and safety of pharmaceuticals; acting as a marketing tool, to win support in regulatory/ policy areas. So, what’s Big Pharma publishing? More in rheumatology and ophthalmology (up 190% and 122% respectively), perhaps reflecting areas of increased therapeutic interest. Interestingly, also up was health policy and services (151%) reflecting greater role in fields closer to patient (or perhaps closer to the market) such as health services and clinical research. The industry’s shift away from agrichemicals and materials explains drop in plant (down 62%) and polymer science (down 71%). Chemistry, in comparison, was relaivly stable, but biomedicine was down 40% and cell biology down 46.5%. Put this data through visualization, and you get a pretty map of threads and bubbles lets you see a larger picture of a diversification of research interests. Also, the drop in biomed sciences can be seen in context of increase in peripheral areas related to new techniques (e.g. computation bio) and a marked shift towards disciplines more orientated to clinical applications. As the conclusion put it; we can see an apparent shift from bench to bedside. There also seems to be some evidence of the organisational shifts many others have noted of Big Pharma in recent years. E.g. there’s a lot of talk of a shift to “team science” of collaboration, especially in biological sciences, medicine and neuroscience. This data suggests it’s even stronger in big pharma. However, interestingly it seems to be external partners which seem to be taking the intellectual lead: there’s a distinctive decrease in the number of big pharma first authors in collaborative publications (from 43% to 35%). The researchers conclude that the picture of Big Pharma their data presents is that of an intellectual follower, not leader. We should be careful of drawing conclusions on this data as a simple proxy for what’s happen in Big Pharma. For example, there was no obvious sign of off-shoring of research to countries outside US and Europe (e.g. Singapore, India and China). However, the researchers suggest that due to division of labour in this particular collaborations and which part of that labor gets author credit, this is one of the areas where publication data underestimates actual activity. Also interestingly, although the oncology publishing increase is consistent with other data on pharmaceutical projects, there was increase in cardiovascular publishing despite decrease in number of projects. As Brian Balmer’s book on secrecy in science tells us, there are complex, often inter-mingling reasons for opening and closing scientific research. Similarly, there are a complex of reasons for publishing and not publishing. Still, it tells us something things and suggests others and if you’re interested it’s worth having a look at the full paper, including appendix. This entry was posted in medicine, scientists and tagged pharmaceutical industry, publishing, science, science policy on January 28, 2013 by alice.